As BoxingScene.com reported on Thursday, unbeaten Germany contender Tom Schwarz (24-0, 16 KOs) is the likely candidate to face Tyson Fury (27--0-1, 19 KOs), when the former world champion returns in June, likely in Las Vegas. Fury was in the ring back in December, when he fought to a twelve round controversial draw with WBC world champion Deontay Wilder. There were serious negotiations to make the Wilder rematch in May, but then Fury signed a promotional deal with Top Rank and ESPN, and they wanted him to fight someone else before a Wilder clash. 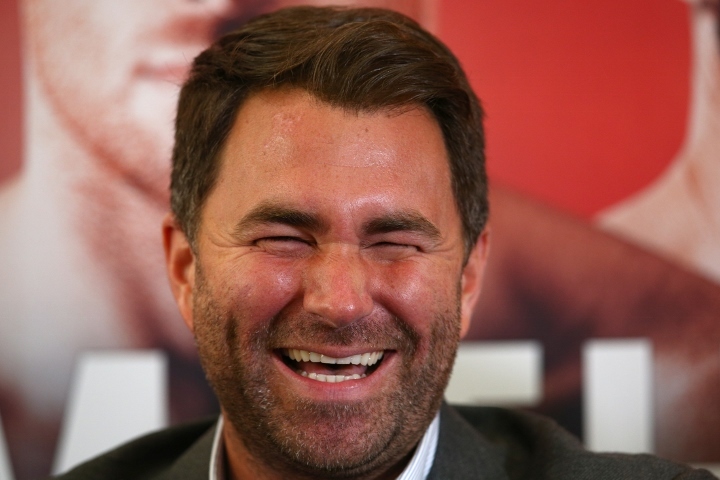 Eddie Hearn, promoter for IBF, IBO, WBA, WBO champion Anthony Joshua, believes Fury's upcoming opponent is terrible. "It’s a terrible fight when you go from rematching Deontay Wilder to then fighting Tom Schwartz. I have to admire Tyson Fury. If he’s getting paid the type of money he’s reportedly getting paid to fight Tom Schwarz, congratulations," Hearn told Boxing Social. Hearn also denied reports that Fury, in victory, would become a mandatory challenger - under the WBO - to Joshua. He said the next WBO mandatory in line would be Oleksandr Usyk, the unified cruiserweight king who make his heavyweight debut in the coming months. And Usyk is co-promoted by Hearn. Also, Hearn doubts Fury would even want to become the mandatory - because in going to a purse bid he would only be obligated to receive 30% of the money with the champion receiving 70%. Fury has already rejected a 60-40 split to Joshua. He wants, at the very minimum , an even 50-50 deal to fight Joshua in a UK mega-bout. "[Oleksandr] Usyk would be mandatory for Joshua. When you’re a super champion at the weight below and you move up in weight you become automatic mandatory. I don’t think Tyson wants to be a mandatory at 30% when he’s already been offered 40%," Hearn said. These are the exact kind of fights you can expect from Tyson Fury over at ESPN. They don't have a very deep talent roster in the heavyweight division. They have no titleholders and only a few contenders.